There's something to watching a film at the cinema that you just can't recreate at home. It's not been easy for picture houses over the years. TV in the '50s, home video in the '80s - both were expected to be the death knell of your local neighbourhood movie theatre. Except it didn't happen. Even at the height of the video boom, people just seemed to like going out to see a film. Thrillers, comedies, horror - the movie experience is just that much better when you're sharing it with others. Although cinema-going continued, the destinations themselves changed. The magnificent theatres of the past have largely been replaced with sterile, corporate multiplexes...the huge auditoriums of the past sliced and diced into smaller units. The argument is that this gives us more choice. The reality is that instead of a greater variety of films, the latest blockbuster gets spread over more screens. The only increase in choice is in the number of start times. Fortunately, some of those classic picture palaces remain. On a recent trip to New York, I took the opportunity to revisit what's undoubtedly my favourite cinema - the Ziegfeld Theatre at 141 West 54th Street. The Ziegfeld - or, more accurately, the second Ziegfeld theatre - opened back in 1969. It's a sublime reminder of those halcyon days when the cinema itself was as much a part of the experience as the film. Not that you can tell from the outside. The exterior is nothing special to look at - plain brickwork, the name emblazoned on the side, a marquee up front, promoting what's on. Once you're through the doors and up the stairs, however, it's a very different story. It's a single-screen theatre - increasingly rare these days - which seats over 1,100. As a comparison, your local multi-screen cinema will seat between 200-300. Ablaze in red and gold, the Ziegfeld is beautifully furnished and - importantly - extremely comfortable. As you settle down with your drink and popcorn, you can't help but be awed by the vast silver screen rising up before you. It's an impressive 52 feet high, the largest cinema screen in New York. Since my first visit there in 1993 to see GROUNDHOG DAY, I've never had a bad experience at the Ziegfeld. The film itself may disappoint on occasion - RIGHTEOUS KILL, a feeble serial killer movie, was a dismal waste of Pacino and De Niro. But what is never less than immaculate is the Ziegfeld's presentation itself - pin-sharp projection, married to crystal-clear sound. The acoustics in the large auditorium are exceptional. I had the chance to see LES MISERABLES there back in December and the theatre did full justice to the powerful soundtrack, with not a muffled lyric throughout. From time to time, there's been the odd story in the press that the theatre is going to close. Fortunately, none of these have come to pass. Indeed, the Ziegfeld is regularly used for movie premieres and special events. This month, an anniversary screening of CABARET was held, with stars Liza Minnelli, Joel Grey and Michael York in attendance; way back in 1972, the Ziegfeld had the exclusive on showing the film in the city. In the lobby, there are framed photographs and programmes of the many events held there. 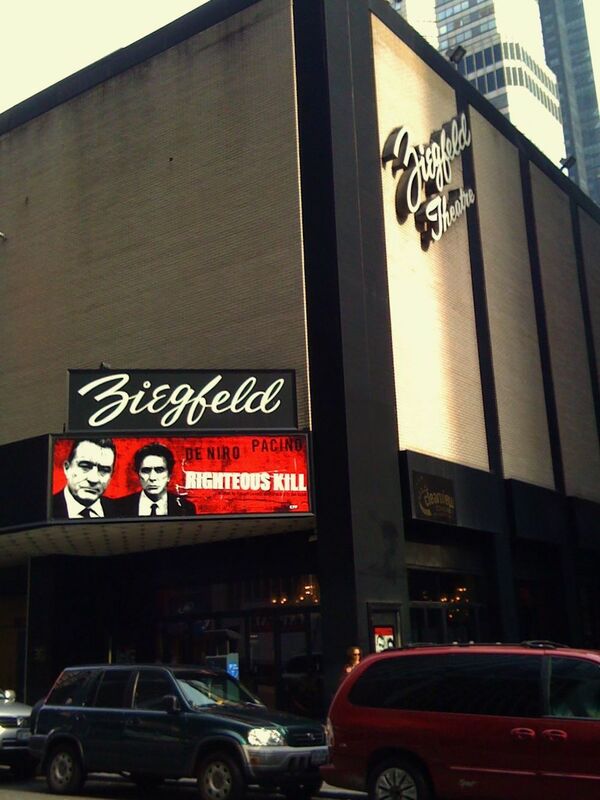 If you're ever in New York, I do recommend a trip to the Ziegfeld. It's a timeless reminder of what going to the movies is all about.